Who is Nin McKay of The Wardrobe? 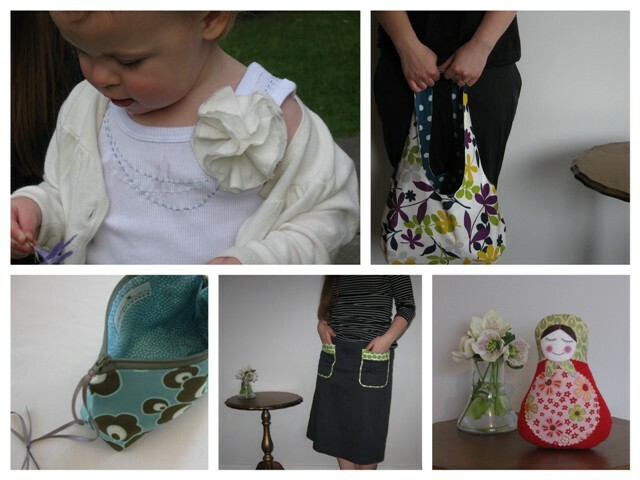 I'm a full time mother and wife, part time sewing tutor and sales assistant at Stitch (fabric and yarn shop), blogger and creator of lovely things. I'm formerly trained as a fashion designer, but was bought up in a creative family – from a young age I took on embroidery, cross stitch, knitting, crochet.... The Wardrobe is a fusion of technical knowledge and crafting skills. I guess you could say fabric and yarn are my primary mediums for creative expression at the moment. I am only limited by time, but I love graphic design and working with paper (scrapbooking) and I love knitting and crochet – these are 'past times' squeezed in around my family, work and little business. • a bobble, glass of water, pen and last but not least my Diary. This actually says a lot about me – that cleaning is waaaay down the priority list (I'd rather create), that I like to have a range of reading material on the go and I'm quite sentimental when it comes to my family. I'm really inspired by Sonia Delaunay – trailblazer and co-founder of the Orphism art movement, painter, fabric designer, set designer and colour theorist. 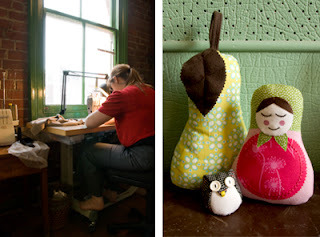 Also I discovered Amanda Blake Soule's blog Soulemama about a year ago. Its not just what she does, its how she does it that really inspires me. She lives her life with such grace and integrity. Creative expression and process, child-rearing, traveling to faraway places, food and wine, dreaming big dreams. I attend Crafty Business on the first Monday of every month which is a get together of likeminded sellers on Felt. Some of the sessions are structured around a business topic (e.g. pricing your goods), some have an invited speaker – there was a session last year where a life/business coach came and gave ideas; and yet others are just a natter and a glass of wine. I think these kinds of catch ups are really good for create networks and making friends in the crafting community. I embrace the late nights! I've always been a night owl and I seem to get my best ideas in the wee smalls. I've just taken a studio space down town, and my daughter is attending Kindy two mornings a week, which really helps with the work/life balance – I'm on a mission at the moment to 'work smarter not harder'. When I'm in my space I don't have any distractions and I'm more productive, so this leads to more sleep, which in turn makes me a more attentive and patient mother. Its not really a screw up as such, but late one night I was cutting a bunch of Maytroshka dolls and the thought occurred that the pattern piece looked like a pear...the pear stop was born. I like to keep an open mind when creating, rather than having a fixed idea in my head of how something should be. Plenty of my products are tweaked as I try different finishes/processes/materials – I like that my designs evolve, it helps to keep things fresh and unique (and exciting for me!). Well it used to be the dining room, half the living room, half the garage and several cupboards, but now its a studio. Hooray! You can find Nin's work on-line at http://www.thewardrobe.felt.co.nz/ and follow her creative happenings at here at her blog. Hi Nin, lovely little peek into your world. I hope those wishes come true soon! Aren't late nights just the BEST time to get things done?! Your work is just beautiful.